Everyone knows Sauerkraut. How about choucroute? Same difference. Well, almost. Choucroute is just the French name for it – so much sexier than Sauerkraut, which sounds like a German on a bad day. The name choucroute (I’m sticking with its French nomenclature, living as I do in Alsace) indicates not just the raw material – smooth white cabbage finely shredded and salted – but also the famous dish, a mountain of steaming cabbage which comes tottering under the weight of sundry sausages, smoked pork meats, potatoes and – if you’re lucky – the occasional liver dumpling. Choucroute is one of those classic, seasonal preserves that was traditionally put up in the autumn to last the whole winter through. To make it, a special variety of tightly packed white cabbage known as quintal d’Alsace is finely shredded and layered with coarse salt in a large container. The action of the salt on the sugars in the cabbage produces liberal quantities of lactic acid, which rise up and completely cover the cabbage, excluding the air and enabling the choucroute to be stored for several months without spoilage. 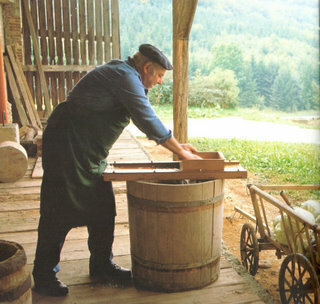 Though a few households in Alsace still make their own in special barrels or crocks stored in the cellar, most people nowadays buy it ready-made – fermented, but still raw. I get it from my local butcher, who sells it in a little green bucket. It’s a neat idea, because at the same time he sells me a selection of his home-made knacks (think frankfurters), Montbéliards (smoked pork sausages), lard salé or fumé (salted or smoked bacon) and schiffala or collet (smoked pork shoulder or neck) to go with it. I have to confess to a special relationship with choucroute. Some twenty years ago, when I was researching my book A Taste of Alsace, I went to visit chef Roger Fischer of the Restaurant Studerhof in the small village of Bettlach, and shared with him my particular interest in this most emblematic of Alsatian foods. Soon I discovered that Monsieur Fischer was a founding member of the Confrérie de la Choucroute, a sort of society for the preservation of pickled cabbage. The French have Confréries or Brotherhoods for just about any food or drink that’s featured in the Larousse Gastronomique, and a few that aren’t. These societies provide a wonderful opportunity for the members to commission and wear some splendid robes and swear undying loyalty to the food or drink in question. Imagine how chuffed I was to receive an invitation to join the august ranks of the Confrérie as a Choucroutière d’Honneur or honorary pickled cabbage ambassadress. The date of the next intronisation (enthronement) was set, and along I went, together with other aspiring choucroutiers. We were greeted by members of the Confrérie, clad in floor-length emerald green robes and black three-cornered hats, each one wearing a magnificent chain of office with an ornate metal badge showing a steaming plate of choucroute surmounted by an Alsatian headdress. The ceremony began and one by one we filed up to the front. Chef Roger raised his polished wooden pole (which looked remarkably like a baseball bat) and touched each one of us on both shoulders, rather as the Queen does to aspiring knights (only she uses a sword). We all had to swear undying loyalty to the choucroute cause, promising to eat it at least once a year and to lose no opportunity to vaunt its considerable virtues. Which is what I’m doing now, with this recipe which we did in my recent workshop, A Taste of the Regio. It’s a bit new-wave and it’s adapted from one that features in my book. 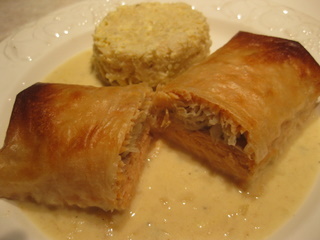 The combination of choucroute with salmon (fresh and smoked) is a happy one: the sharp chou provideds a nice foil to the rich oily fish, and instead of puff pastry as in the original, I’ve used brik pastry. Simple, stylish and delish. Worthy – I hope you’ll agree – of a choucroutière d’honneur. I started making choucroute garni many years ago, right after buying your Alsace book. Now I’m fortunate to live in Maine, where we have one of the best sauerkraut producers in America, if not the world (the owner said he often gets orders from Germany). And an hour south of me in Massachusetts is a fantastic producer of German style sausages, Karl’s Sausage Kitchen. I realize that if I lived in Alsace I’d only have to drive 10-15 minutes rather than an hour for those 2 products, but it’s not bad for the US. sounds like you’re in the right place, Bob with a reliable source of choucroute and sausages – can’t be bad! Sue, just about to dive into your recipe for our fish course for Christmas lunch. Hoping to convert the girls to one of my favorite flavours! Having seen your name on the list of choucrouterie friends when we ate at the Studerhof recently, I was delighted to read the whole story!! !